As you dress your six-year-old for school, you notice several red bumps on his back. They don’t seem to be bothering him, and he is acting fine. You drop him off at school with a kiss and go about your day. At lunchtime to receive a call from the school. “Johnny has a fever, please come pick him up.” Later that day you notice several more spots, and the next morning he wakens with fifty or more scattered throughout his body. It suddenly dawns on you, “My child has chickenpox!” What should you do? Should you take him to the doctor? How can you really be sure it’s the chickenpox virus? How do you make him more comfortable? Here is the Dr. Sears guide to diagnosing and treating the chickenpox virus. Chickenpox is caused by a virus called Varicella. How do I tell if my child actually has chickenpox? It starts off with a few red spots or bumps (often mistaken for insect bites). Fever is common. The next day many more bumps will appear, and the first bumps will have turned into blisters. On the third day, more new bumps will appear, and the second-day bumps will start to blister. On day 4 the original blisters will start to crust over. Usually by day 5, no new bumps will appear, and more blisters will crust over. By day 7, most or all of the blisters will be crusted over. The fever can last for 5 days. The total number of spots is around 200 on average. The key to diagnosing chickenpox. Watch the progression of spots from bumps to blisters to crusts, and to have a mix of all three types during the illness. Very important note – it is nearly impossible to diagnose the chickenpox virus on day 1, and still difficult to know for certain on day 2. Therefore, do not bring your child into the doctor on day 1 or 2 and expect a definite diagnosis. If you think its chickenpox, then quarantine your child until day 3. If the spots have progressed as described above, then you probably don’t even need a doctor to confirm it. If you suspect your child may have the chickenpox virus draw a circle around a few of your favorite spots. If they all become blisters within a day, they are probably chickenpox. If they don’t change dramatically then chickenpox is unlikely. What else could it be if its not the chickenpox virus? Insect bites. Flea, mosquito or spider bites are common, and can often look like the bumps and blisters of chickenpox. Other viral illness. Just as chickenpox is a virus, there are several other viruses that can cause bumps. These are all harmless and resolve on their own. It is not important to know which exact virus it may be. Contact dermatitis. Some plants or other outdoor items can cause the skin to break out in bumps. These will resolve. When should I call or go see the doctor? For straightforward cases of the chickenpox virus, you don’t really need to see or even call the doctor. You are not sure about the diagnosis after two or three days have passed. An infant 2 months or younger catches the chickenpox virus. Your child has a weakened immune system such as from an immune disorder or from taking steroid medication. The mother of a newborn baby breaks out in chickenpox less than 3 days after the birth. Your child has fever more than five days. Your child develops a moderate to severe cough. Severe headaches develop even when fever is controlled (high fever can cause headaches, which is not worrisome). Significant dizziness (spinning feeling) occurs. Severe headaches with vomiting and stiff, painful back of the neck or spine. Any spots become infected with redness spreading outward from the spot with puss draining out. Your child has spots on the upper or lower eyelids, or has red, painful eyes. You are pregnant, are exposed to the chickenpox virus, and have never had the illness or the vaccine. Your child has severe headaches with vomiting and stiff, painful back of the neck or spine. If your child seems seriously and unusually ill. Otherwise, the chickenpox virus is not a serious illness and rarely warrants paging the doctor after hours. Your child is contagious starting the day before fever or spots appear, until 24 hours after all the blisters have crusted over. This usually takes about 7 days from beginning to end. How did my child catch the chickenpox virus? It is passed through the saliva, coughing secretions, and direct touch. In general, you must either be living in the same house, or play indoors in close face-to-face contact for more than 5 minutes, or have close face-to-face or physical contact outdoors in order to catch the illness. How long until my child becomes sick after exposure? The incubation period (the time from when your child is exposed to the time he will break out in spots) is generally 14 days. It can be as early as 7 days and as long as 21 days. If three weeks pass from your child’s exposure, than he is in the clear. I am pregnant and was exposed. Can this harm the baby? If you had the chickenpox virus previously, or have had the vaccine, then you should be immune and there is virtually no risk to the baby. If you never had the chickenpox virus or the vaccine, then you should contact your obstetrician right away to discuss possible options for preventing the illness. I have a newborn and my older child was just exposed to chickenpox, or just broke out. What should I do? If your older child was exposed, then try and keep the baby away from him during the 7 to 21 day period after exposure. This may be tough, but it’s important. Breastfeeding will help provide your baby with some immunity. If your older one breaks out in chickenpox, then just quarantine him until no longer contagious as above. If your newborn infant was exposed before you knew the situation, there is really no way to prevent the illness, yet most likely your newborn carries your immunity to the chickenpox virus. Benadryl (an over-the-counter antihistamine) is very effective in decreasing the itching. Use it as needed. Click on benadryl for dosing. Oatmeal baths: Aveeno or other brands can be purchased at the store. This can soothe the itching. DO NOT USE ASPIRIN DURING A CHICKENPOX INFECTION. This can cause a serious reaction. Acetaminophen (Tylenol) and ibuprofen (Motrin or Advil) can be used to treat the fever. ONE IMPORTANT NOTE: Do not treat the fever if it is below 101 and your child is feeling relatively okay. 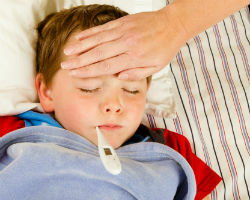 Studies have shown that children do better overall when some fever is allowed to continue during this illness. Therefore, only treat the fever if it is high, or you child is bothered by the fever. Acyclovir is an antiviral medication that has some effect against chickenpox. If started within 24 hours from the onset of rash, it can shorten and lessen the illness. It is not, however, recommended for routine use in normal, healthy children because its benefit is often not very significant. Acyclovir is recommended to be used for people who are at higher risk of having a severe case of chickenpox such as people over 12 years old, adults, people with immune deficiencies, or people on oral or inhaled steroid medication. If you have been exposed, and think you may qualify for acyclovir, see your doctor before you break out to discuss this, and to have a prescription ready to fill at the first sign of rash. For children and adults with no history of the illness or vaccine, giving the chickenpox vaccine within 72 hours of exposure (before you even break out with the rash) has been shown to either prevent or decrease the severity of the illness. If more than 3 days have passed since exposure, it is probably best not to get the vaccine then. Click here on chickenpox vaccine for a detailed discussion on the pros and cons of getting this vaccine.